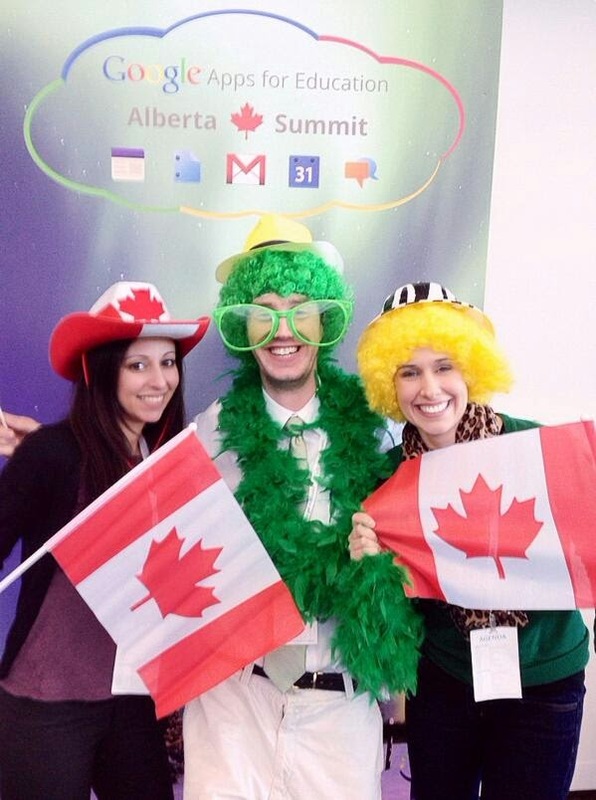 I made the trip out West to Edmonton for the Alberta Google Apps for Education summit hosted by EdTech team. I came into it with high expectations after my experience at the Montreal summit, and I was still blown away. I got the chance to meet both +Dana Ariss and +Theresa Wells-Taylor, two members of the #cdnedchat team. It was fantastic to get a chance to see them in person, sit together, tweet back and forth, and generally enjoy geeking it up. It's funny, because I had never met them face to face, but I felt like I was with good friends, right from the first "Are you James? It's us!" An odd experience to not know if those people are the same ones you work so closely with week after week... I was also able to catch up +Lise Galuga , +Michelle Armstrong , +Monica Isabel Martinez , +Ken Shelton , +Mark Wagner , +Holly Clark and many other GAFE friends. It was wonderful to see so many familiar faces in such a positive environment yet again! And I met some amazing new people, too. Chatting in the halls, catching up after sessions, or having lunch together, I was struck once again by the atmosphere and the attitude of sharing and learning that permeated the whole event. I had the same conversation a few times, always with the same conclusion: the tools we're learning about are powerful because they're constantly growing. Whether through development at Google or through additional functionality created by users, GAFE works because it evolves. It's a gathering of people who are passionate about learning. Notice I didn't specify that they're passionate about teaching. That's also true, but it's not what makes the people unique. We've all gathered to grow as educators, to try new things, to share, connect, network, and get excited. I believe that the best teachers are those who are excited to learn. That enthusiasm is contagious. The whole event is structured to be fast-paced, engaging, and to cover a lot of concepts. I get a bit overwhelmed by the end of the second day, and I know I'm not the only one. A single hour to learn new things is short. There are so many things to learn, too. When I'm giving a session, I always run out of time. Always. And it's not because I haven't planned well. I believe it's because I just get so wrapped up in sharing those little "hey, check this out!" things that I never make it as far as I'd hoped. The menu is varied. Going to a summit isn't like sitting down at a dinner where you get a nice plate, time to digest it all, and everything is relaxed. It's more like a cocktail party, where you can grab a bite from a passing tray without disrupting the constant flow of interaction. This is fantastic because it gives us exposure to a lot of different ideas, but it can be challenging to remember everything you've "tasted" once it's all over. At the end of the second day, I knew a few things. First, I knew that my brain was filled to the brim with ideas. I'd probably have forgotten my own name by the time the last keynote was finished. I also knew it was an amazing event, because the room was packed during the final keynote at the end of day two. People who had spent the last two days learning were still positive, enthusiastic, and energetic. And we had fun! Sadly, it can be a rare thing to really enjoy yourself during professional development. Many thanks to the whole EdTech Team for putting on such a great event, and for making me feel at home. They are an amazing group of people, and I will continue to connect, learn, and share with them (and with you, since you're reading this). As a little explanation for why it took me three days to finish writing this blog post, keep your eyes open for a cool little tool I've been developing. It's now in the final stage of testing, and promises to blur the line between the classroom and the home by giving parents some quick and easy feedback about what's happening in my classroom. What a good read, James. So true. It was great to meet you and chat with you. Your enthusiasm was infectious, and you inspired me to just go for it when I presented. I'm so happy that I was able to inspire you! I tend to be VERY enthusiastic about teaching in general, educational technology in particular, and Google in all things... The best thing I've ever done was to learn how to go for it despite my hesitations, and I'm happy that feeling is contagious. Keep on going for it!